A national disgrace, scoundrel and extremist*: How Menie masterplans? I've written to the architects in charge of the masterplanning exercise at Menie asking whether they will be preparing one masterplan or two. Last week, Aberdeenshire Council failed to rule out the use of compulsory purchase orders for five properties at Menie leaving uncertainty for both residents and the Trump Organisation. But with the residents determined not to sell willingly and all indications still being that councillors believe that using compulsory purchase powers for private profit would be wrong, Gareth Hoskins Associates now have a problem. Will the realistic boundaries be the original boundaries or can they can include the disputed lands belonging to my constituents? Or should he simply prepare two? A masterplan was a key requirement of the planning permission granted by Scottish Ministers and the intent was for a masterplan to be agreed before detailed planning permissions can be lodged and any development can start. But until the threat of CPOs is wthdrawn completely, no-one can know where the bounds of the masterplan should be. If my constituents properties are included in the masterplan, it may never be deliverable and the Trump Organisations noise about starting in November may simply be more Trump noise - they don't usually stick to any timetable they advertise. which as chestnut pale fencing has been erected is part retrospective. Just to prove to the detractors that the issues concerning the Menie are wider than just the issue of CPO's. Interesting to see that on the same page as your reminder about Earth Day, there is a link to the planning permission for planting of marram grass seeemingly a 'foreign' grass species to the detriment of native species of Grass (The Botanical Consultant's report is worth reading for those interested in conservation). How is it that an endangered species growing in a supposedly protected SSSI can be simply machined, fertilised or over planted out of existence, SSI status was not granted simply because the dune system looked nice. I hope the council studies the report into the ecology of the dunes and particularly notes the last comment regarding the development. Why has this fencing been erected without planning permission? No retrospective permission should be given on such an important site. When will it be considered by the Council? or will Trump be permitted to carry on trashing this site without permission. 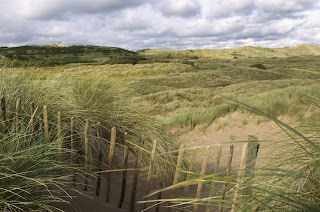 The botanist David Welch stated in his most recent letter that metal stakes had been concreted into the dune. Trump's people could be critically endangering this site and being allowed to get away with it. Why is this being allowed to happen? Also the plans for the course layout have been changed yet no permission exists for these changes. SWT state that TI are in breach of the agreements made when outline permission was granted - is this true? David Welch also states that certain endangered species have not been correctly classified in Trumps EMP - I'm sure that he pointed it out in letters more than a year ago, again this just should not be tolerated. No doubt the nitrification from run off will destroy much of the habitat too! Why has it taken so long to appoint an ecological clerk of works? perhaps no self respecting ecologist wants to take this one on. Do you know if an ecologist has been appointed now and a new EMP been carried out that takes into account the course layout changes? If not surely the work can not commence in November. More questions need to be asked about the letters that Anne Faulds sent to Alan Campbell, recently published on Rob Edward's blog- no wonder he resigned! perhaps he knew what lay ahead. The Council should have stood up to this bullying at the outset. They are now in a 'no win' situation. They have bent and broken all the rules to accommodate this bully and need to answer for their actions. Only a handful of Councillors, including yourself, had the strength and knowledge to stand up to TI. I'm sure many more FOI's requests could be made to find out what really happened. No doubt it will cost us dear in the long term. I don't really understand the planning system but this whole trump business is a disaster for the NE. Particularly for the individuals with their homes threatened by something as futile as a golf course. I felt sick when I saw Sara Malone say that this was not about individuals but about the future prosperity of the NE - she should be ashamed of herself!